We have just undertaken a comprehensive evaluation of an RGB LED ribbon which has 120 x 3535 LED/m. Manufactured by our normal supplier who we have established an excellent working partnership with as they continue to supply high quality products. Their diligence and technical know-how is second to none. Available in IP20 non-waterproof or IP66 waterproof. This new to the market LED ribbon compliments our existing RGB ribbon product range. At introductory level we have our standard 30 x 5050 LED/m RGB ribbon with Epistar chips in 12Vdc. 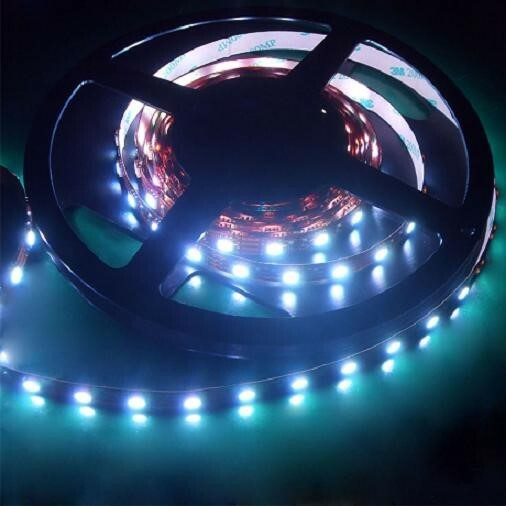 Our professional RGB LED ribbon has 60 x 5050 LED/m and is powered by 24Vdc. For the professional installation we offer a Digital individually addressable LED ribbon in 5Vdc. So we, LED Illuminations, really do have the RGB LED market covered. Not only are we able to offer a wide range of products, voltage and IP rating but supplied by a reliable manufacturer. LED Illuminations offers a bespoke product service. We can have manufactured to order any of the above products in lengths to suit your application with extended integral power cables to make installation easy.